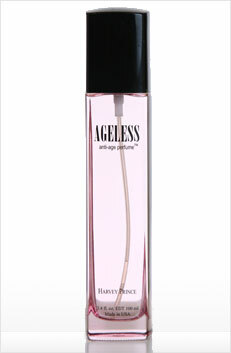 For my review from Harvey Prince, I received a bottle of Ageless. For years, I have used the same perfume scent. One, because I absolutely love the smell of my old perfume, but two, because I was afraid to spend my money on something, I wasn't even sure I'd like. So I was SO excited to try Ageless! I wasn't sure how I would like it, but after using it for over a week, I can say I absolutely love it! The scent was a mixture of several things, including: Pink Grapefruit, Pomegranate, Mango, Jasmine, Tuberose, YlangYlang, and Sandalwood. It obviously had a fruity scent to it, but it was also really sweet. It was exactly what I look for in a perfume. Ageless, is all about smelling how you want to feel; Young! Nobody wants to feel old, and this perfume really does that. In recent studies, it was actually found that pink grapefruit and mango are olfactory antidotes to aging. So the smell helps to disguise the smell of age, which is caused by the breakdown of fatty acids in your skin. I really absolutely love Ageless, and I am so happy I had this opportunity to try it! I definitely plan on getting it again in the future. If you want to try any of the Harvey Prince fragrances for yourself, but your worried about spending the full amount for something you might not like, don't be! Harvey Prince offers samples for an extremely affordable price. And actually, if your interested in trying a sample [of Ageless], you can actually get one right now by using the code sampleageless at checkout; And all you have to pay is a small shipping fee. Or if you are interested in purchasing a full 100ml bottle, you can save 50%, by using the code Agelessvintage. 5 of you will receive a full 100ml bottle of Ageless! Valued at $98.00 each! Entering is super easy (as always) with the Rafflecopter form, directly below. Disclosure: Review product was provided to me free of charge. All opinions expressed are my own, and were not influenced in any way. Facebook is not associated with this giveaway. This giveaway will end on April 10th, 2012 at 11:59 pm. Winner will be drawn via Random.org, and winner has 48 hours to respond to my email, before a new winner will have to be chosen. i want to try Hello Eau de Parfum Spray. I'd like to try Hello or Coupling. I would love to try Eau Flirt!!! I would like to try Eau Fling! Hello is the one I would like to try. I would love to try their Eau Fling perfume! Would love to try Eau Flirt! i would llke to try ageless.. sounds good.. I'd like to try "Hello"
I'd like my wife to have the Eau Flirt, with notes of pumpkin pie, I'd have a hard time staying away. I want to try Eau Flirt :D Looks interesting! I'd like to try Hello. Eau de Creme would be the scent I'd like to try. Thanks for the giveaway! I'd love to try the Eau de Creme or Coupling! Eau Fling is one I'd like to try! I would like to try Eau Flirt. I just seen this was open to US ONLY, please delete my entries. Yogini sounds like something I'd like to try. Please delete my entries-under name Glogirl. (I'm not in the US). Another Harvey Prince fragrance I would LOVE to try is the "Yogini"! I'd also like to try the Eau Flirt. Neat giveaway. Thanks. I'd also like to try Eau Fling! Would love to try the Yogini Fragrance.